From Scriptures is Mary the new Eve? The video below is a must see for ALL Christians. Whoever believes in Jesus as their Saviour is ought to ponder at some point on questions regarding the woman who actually brought Him into the world. The one who, unlike Eve, obeyed God and said ‘yes’ to his holy will, for the sake of our Salvation, which comes from her Divine Son, Our Lord and Master Jesus Christ. This video gives an incredible Scriptural insight on Mary’s role as the New Eve. Just as Jesus is the New Adam. Furthermore, the video will show scriptural evidence that supports the understanding of Mary as the ‘Woman’ of the Book of Revelation. That’s a must see!!! A priest once asked Lucy, one of the visionaries of Our Lady of Fatima, “Why five Saturdays, and not nine, or seven, in honour of the Sorrows of Our Lady? (Our Lord had previously requested this from Seer Lucy in one of His apparitions). The offenses of those who outrage Her holy images. Please follow link for more info on the Reparation of the First Five Saturdays. Why do people insult The Virgin Mary? 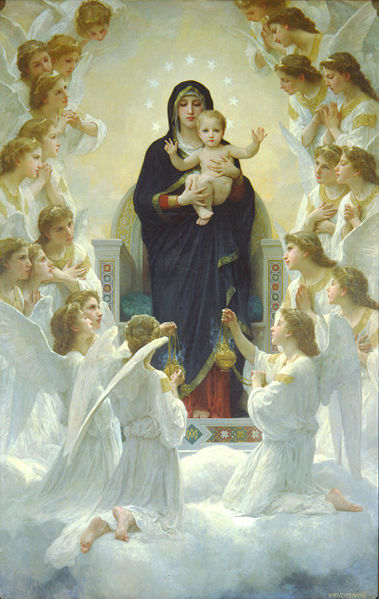 Today I thought I’d write about the antagonism expressed by most non-Catholic Christians in regards to the Blessed Virgin Mary and/or the Catholic views on Mary, the Mother of Jesus. Most protestants tend to become emphatically averted towards Catholicism because of Mary and it is not uncommon to hear people blaspheme and insult the Virgin Mary, because of their strong opposing opinions on the subject. It seems that however well-meaning and good intentioned they may be, many fail to acknowledge the importance of the Holiest woman of all times, the one who carried Jesus in her womb. One obvious question that comes to my mind is why would any one who loves Jesus choose not to honor His mother? Certainly, God wouldn’t have chosen Mary to become the mother of Jesus, if she wasn’t very special. Would God choose any-one else but the most worthy woman to be the Mother of Christ, Who comes from the Father and is One with the Father? Anyhow, it seems that such resentment is caused either because of ignorance or prejudice, or both. Unfortunately, there are many Christians who believe that Catholics worship Saints, or that we hope to get to Heaven through faith in Mary rather than in God! When in fact, Catholics hold that salvation is a free gift of God and that there is nothing we can do to for ourselves to ‘deserve’ or ‘earn’ our salvation. In spite of their faith in God, Catholics rely entirely on His mercy and grace to gain eternal salvation.